Going public is an effective way to create access to a wide range of capital market financing options for your company. Successful companies will have the opportunity at a certain stage of development to consider a stock market floatation as the next major milestone for the company. Our pan-European platform is designed to support companies in meeting their long-term objectives and its success is demonstrated by the important number of companies, including international companies, joining our markets annually. A stock market listing is a major milestone and several dimensions needs to be aligned to succeed. The management of the company will need to have a clear understanding on how they intend to use the capital markets and what are the key rationale behind this decision. Then, it must assess the company’s suitability for listing and select the best listing venue to maximize value of the listing. There are different ways to come to market, from a direct listing without capital raising to an ‘initial public offering’ (IPO), as well as different markets with several sets of rules and obligations. The choice will be made on the type of business, profile and its capital requirements. We are happy to discuss various alternatives with companies regardless of where they may be in their evaluation process. Ultimately you will also need to involve your advisers in discussion on the different methods of going public with. Going public leads to creation of additional financing sources, enhanced visibility and credibility of the business and provides the resources for your your business needs to grow. 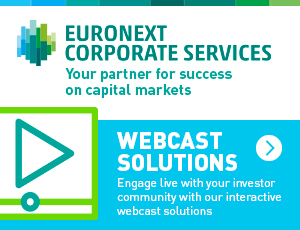 Joining one of Euronext’s markets offers access to most diversified pool of investors in Europe. A critical component of any stock market is liquidity—the presence of ready and willing buyers and sellers at all times. Because our scale and single order book model on a Pan-European basis, Euronext represents the deepest source of liquidity in Europe. Deeper liquidity leads to higher trading levels or velocity of the stock, tighter spreads on buying and selling of your shares and lower volatility of share price. These key factors are crucial for attracting global investors. The benefits of deep liquidity extend to all your shareholders. Going public provides the opportunity for the company’s initial investors to sell all or part of their shares at the time of the IPO (initial public offer), or gradually once the company is listed. They can also choose to increase their stake in the company through market offerings and share the risks with new shareholders while they benefit from the potential increase in the company’s value. A stock market listing significantly increases your company profile. It highlights the company’s ambitions, organisational structure and financial strength as part of meeting of the required quality standards and transparency objectives. The benefits of better visibility and reputation is often quoted by issuers as an important impact towards its network of suppliers and providers, and is also used to expand business activities with existing clients and new prospects. Going public also has a significant internal impact, often leading to greater focus and better management practices as well as greater ability to recruit and retain the best talent. The project of going public typically gavanises employees around this key project and highlights the quality of the men and women working within the company. Furthermore, publicly-traded companies are typically better equipped to align its economic interests with those of its employees through share-based incentives (equity options, company savings plans etc.) by giving employees a direct stake in the company. Our team of dedicated experts is available to support you in the process of evaluating the alternatives available to your company and advise you on all aspects of going public regardless of where you may be in your evaluation process. Ultimately you will also need to involve your advisers who can support the execution of your preferred action plan. If you are seeking an advisor to assist you with the going public process, we can help by connecting you with the advisors active on the on Euronext markets.